Now that you have toured the front yard let’s tour the back. We’ll take a walk down the side path, the picture on the left, which in a few years will have flowering trees blooming in the spring. When we get to the back you can see the yard, the picture on the right. On the south side of the path we have a climbing hydrangea making its way up the deck railing. Further along we have the shade garden, which gets only a couple of hours of sun. In here we have multiple varieties of hostas, astilbe, mums and columbine, with Plumeria, Monarda, and Campanula. On the north side of the yard is the sun loving garden. We have lilacs surrounded by Salvia, Sedum, Coreopsis, Munstead lavender, and Russian sage. 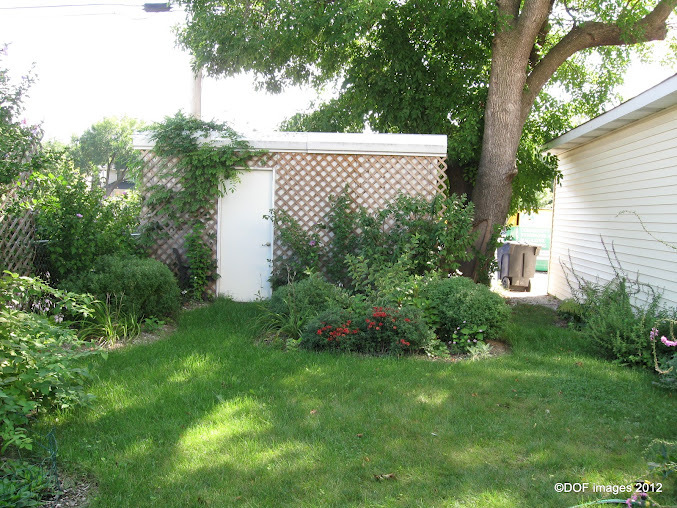 Then we have the rose garden, in the middle photo, which is so exciting because these roses were all grown from seed! They are only two years old right now so they are still pretty small. I will spread them out a bit this fall in preparation for next year’s growth. I have mums centered in this garden to offer some additional fall color. The picture on the right is our pergola. We built this to accommodate the grape plant that is now vining its way to the top. I did the design work, we sawed out the decorative ends and put it up in a couple of days. Facing to the north we hung a decorative metal piece. This was actually the back of an old wooden bench that had seen better days. We recycled the wood and used this piece to add some character to the deck. Then we hung little plants off it to add more color. In each of those pots is a moon flower vine that climbed up all the way to the rafters. Really exceptional! We also have hooks in the rafters to be able to hang all sorts of plants at different heights. We have pots on the deck, on the railings, and on decorative racks…flowers everywhere. We have also harvested some nice vegetables, the picture on the left. The zucchini was 14 inches long and the eggplant bigger than a softball. I am very pleased with the result of my first attempt at these two plants this year. Hope you enjoyed the tour. As always let me know if you have any questions or comments. btw – Thanks to Rich and Alice for the vegetable plants that were so successful this year! Welcome everyone to my Garden Party. It is really quite easy to show off your garden to friends and family on a pleasant afternoon. All you have to do is put some chairs on the deck or in view of the garden and provide some lemonade and cookies. Guests are usually more than willing to bring something, so ask for easy finger food and light drinks, put out some flower pattern napkins and maybe even a bouquet on the patio table. All of a sudden its a party! Of course, the center of attention is the garden so here is a tour of my garden now that it is in full swing. If anyone wants to the know the full Latin name for any plants leave a comment and I will respond. You walk up the carriage walk and both of the trees in the parkway are surrounded by groups of plants that do well in the this mix of sun and dappled shade. Tulips burst out in the spring, along with a nice patch of irises. There are two types of hostas, astilbe, sedum, lamb’s ear, and new barberry shrubs and vinca. On the left there is a full garden of chameleon plant, creeping jenny, and angelonia, with begonia and million bells tucked in. The taller group in the center is zinnias clustered around a mum. The larger shrubs in the background are lilacs, and there are also incredible hydrangeas, the flowers shown in the second picture. On the right of the path is another garden offering sedum, spirea, and mums with asters, alyssum, and spotted dead nettle in the foreground and lamb’s ear, irises and peonies in the background. Oh, and the edgers surrounding the gardens are my custom work. I designed them, built a mold to mass produce, mixing, dying, and pouring the concrete, and shaping before final curing. We made about 400 of them to line the entire front gardens. To the left of the front steps is a rose arbor. We put in two decorative trellises and used the rose itself to created the top arch of the arbor. The morning glories on the railing are so vigorous they have made their way over to the arbor and are intertwining with the roses to give us color for the rest of the summer. On the right you find the mixed border planted in front of the lilac, dogwood, and butterfly bush. This shorter group is plumeria, irises, campanula, boxwoods, and peonies with a rogue zinnia sprouting right up in the middle of it all! 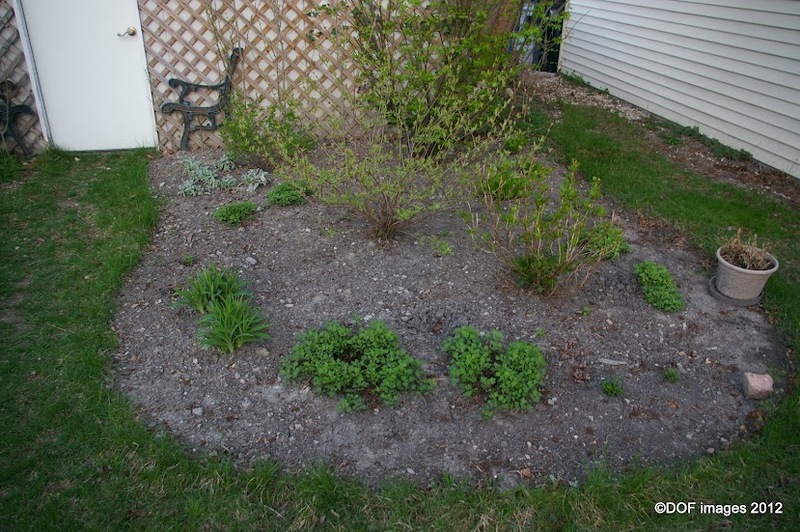 The oval is two types of lavender with annual additions-ageratum and “black and blue” salvia in view. The arbor in the picture is the passageway to the back yard which holds more exciting gardens to show you. In the next post we will visit those gardens. Can’t wait to show you my rose garden! As always, any questions or suggestions please comment. So this post will wrap up the travel series showing a bunch of perennials we saw on our trip to The Berkshire Botanical Garden, which, by the way, is one of the oldest botanical gardens in the nation! Here are two exceptional plants, each special in their own way. The first is Arum Italicum, Italian Lords-and-Ladies, which does best in shade gardens. This plant is so interesting…it offers up arrow shaped leaves in the spring with a stunning “flower” that looks like a calla lily. The actual flowers are on the spadix, which is the spike in the center of what appears to be one big petal, which is itself a modified leaf. When the leaves and flowers die off the spike remains and each little flower on it produces a berry, and you get this unique plant shown in the first picture above. You can plant other things under it that offer foliage in the summer because the Arum leaves will reappear in the fall! The next picture is Eucomis pallidiflora, Pineapple flower. It speaks for itself with that wonderful collection of flowers seen in the summer. This plant can get tall and really is a sight to see. There are varieties of this plant, like Sparkling Beauty with purple leaves and flowers, that may make it thorough a Zone 6 winter. Regardless of the variety you chose you can pull the bulbs out and replant in the spring (like Dahlias) for a guaranteed summer show. This is Clethra alnifolia, Summersweet. This plant reminds me of a butterfly bush with its spiky grouping of fragrant flowers, accompanied by a rich, full foliage. A really nice native shrub to add to your garden. Here are two plants that just fill in empty spaces so well. The first you may already know, Stachys byzantina, commonly called Lamb’s ear. This amazing plant has foliage as soft as a fluffy fleece. You can not really imagine it until you see it and feel it brush your skin. I would recommend this plant to everyone just for the shear joy of watching people experience its softness. It also produces a tall spike with small purple flowers that can be enjoyed or cut back. It grows quickly, can handle full sun, and is easily managed by just keeping in clean and reined in. The second plant is a grass, Hakonechloa macra or Japanese forest grass. The blades of this colorful grass just float on the breeze and drape gently over like a waterfall. The mounds appear full, covering the ground well, and yet the grass is light and airy. This one likes part shade, too much sun and it may scorch. I saw this plant and just loved it with its huge display of flowers, like a foxglove I thought. I was going to leave it out of this post because I could not determine its name. I am sure someone out there must know what this is. Please do share it with us, leave a comment and I will let everyone know. The last picture I include for the beauty shared by the flower, a Hydrangea, and my niece, Zoe. We spent the entire afternoon together just taking in the scent and color of all these amazing plants and when it got a little to warm she would ask if we could rest on a bench in the shade. The sweetest, most precious little voice, and look at that face! Again, thank you to my husband Ed for catching this moment forever. The next post will be on my Garden Party! I will share my garden through photos, spreading the joy of flora and fauna. Back from our travels we found so many wonderful plants to share with you. Make sure you click on the pictures to really see the plants up close. These plants were all found at The Berkshire Botanical Garden in Stockbrigde, Massachusetts. This post will cover annuals you can use for a display garden. We will talk about perennials in the next post. This display is extraordinary and really it is just two different plants. The yellow-brown foliage is Ipomoea, the sweet potato vine, yes, like the kind you eat. This variety is ‘Sweet Caroline Bronze’, offering that wonderful color. We often see the green ‘Marguerite’ and dark ‘Blackie’ varieties filling up pots and window boxes. Now you know another variety to add some new color. There are three purple plants in here too, all of which are Ageratum. By using three different varieties you get different heights and colors. For a tall blue plant you might choose the ‘Blue Horizon Tall’ variety. For the shorter blue try ‘Blue Hawaii’. For the rich violet purple color on the right try ‘Purple Fields’ or ‘Artist Purple’. Falling out of this container with tons of bright pink flowers is Portulaca ‘Pazazz’. What a brilliant display of flowers for the summer. Put this in a pot on your steps or porch and enjoy the flowers every time you walking in and out your door. This sweet little ground cover with its rich foliage and bright yellow flowers is Oxalis spiralis ‘Burgundy’. Again, adding interest and color to the garden with its colorful foliage. This one could be up in front at the edges of a garden bed to keep it visible. For something really different and truly amazing you might consider the spiny tomato plant in these pictures. This is Solanum quitoense, aka ‘Bed of Nails’, and it is a defensive plant to say the least. All along the burgundy veins of the large green leaves you will find these sharp, pointy spikes. In my excitement and awe of this plant I learned quickly how sharp these spikes are! This would make a really interesting addition to a specimen garden. For those not familiar with the term “specimen” that means that you have a plant in a visible location specifically because it is great to look at, especially up close. Plants can be ornamental and functional too. Take this Opal Basil plant…look at the color it will add to your herb garden or even to a pot, and it has a full and rich scent and flavor, much like the green variety. So there you have some exciting annuals for bright summer display in beds and containers. Stay tuned for the next post on perennials that will offer enjoyment year after year. As usual, any comments or questions are encouraged! btw – Thanks to my husband, Ed, for his excellent photos. As part of our travel series I wanted to promote the use of a garden journal. On this trip we’re using the journal to take notes on the plant varieties and garden styles and designs we see in our travels to possibly incorporate them into the garden back home. This is a great way to remember what we saw and why we want to use it. In the next post you will see some of the things we added to our journal. A garden journal can help you manage the ever-changing design of your garden. What is a garden journal, you ask. . . A garden journal is pictures and notes about your garden in every season. So in the fall you have a reminder or description of your spring design so you can see where you may want to plant bulbs, for example. And by referenceing your summer and fall notes you’ll know what areas need attention, like dividing and moving certain plants. Below is a picture from my journal that shows the spring view in my mum garden. Clearly this area is barren in the spring and with theese notes I plan to address this in the fall by planting bulbs. The summer picture of the same area, in the center of the photo, shows a much fuller garden which tells me that the bulbs I plant should finish their growth cycle by early summer to make way for the other plants. I also see that there is some room for ground cover in the summer and these pictures help remind me how much shade this garden gets when it is in full bloom so I pick the right ground cover. In this case I want to choose a ground cover that grows no more than six to eight inches tall, has a leaf color outside the average green range, and likes a lot of shade; maybe spotted dead nettle would work here. Get yourself a spiral notebook or three ring binder or even walk around with your iPad. Take notes, take pictures, and create a record of the evolution of your garden. Stay tuned for scenes from the Berkshire Botanical Garden. btw – Thank you to my sister for her excellent suggestion about garden journals. So you can see from the pictures posted that vegetables can be grown anywhere. Above is cucumber. Next, two pots, each with 4 plants in them, 2 eggplant and 2 tomato. This is too many. I planted these thinking the tomatoes would not make it, well they did. The plants will be fine I will just have to water much more often and add additional fertilizer so all 4 plants get enough of what they need. The gourd vine in the pot below was a volunteer. It popped up at the beginning on of the season in my neighbor’s yard, a remnant from last year. We are not even sure of the variety. I was curious to see how this might work in a pot and a random gourd plant seemed good for a trial. For now the vine is doing OK. It seems that there is some stress on the main stem as it bends to drape over the side. I will need to address this or I might loose the bulk of the plant. Also in the pictures is my “regular” vegetable garden, with eggplant, cucumber, zucchini and gourds. I use grass clippings to keep the weeds down. Every time I mow (meaning my husband mows) we collect the clippings instead of mulching them into the lawn. Yes the mulch is good for the lawn when done right (a future post topic), we like to use it for the veggies. Just pull out visible weeds and lay down the clippings in a nice mat throughout the garden. It really keeps the weeds down and next year when you are preparing the area you will see a noticeable improvement in the quality of the soil since the grass composts over the year. Use a good fertilizer at planting and again mid season for a good boost where needed, in some cases the whole garden. For leafy greens you can try a liquid fish emulsion added to your watering can for a nitrogen source. This will work fast and green up the leaves really nicely. If you use a solid form, for any vegetable, dig a small trench around the stem for the fertilizer, about a foot in diameter, and then cover it with soil. This keeps the fertilizer in the soil and not splashing up on the plants when you water, which can cause burning. Don’t overdo the fertilizer as it can build up in the soil and cause other issues. Apply the boost fertilizer in July generally, and specifically when broccoli just heads up, when corn is about 20″-24″, on big vines before they run away, and tomatoes and peppers when they bloom and again in 4 weeks. It is just thrilling to eat fresh veggies you grow yourself, and so delicious. Let me know if you have any questions. Tune in next time for the beginning of our travel series. We are taking a trip to the Berkshires and will report in on exciting plants we find. btw- Thanks to my mom, who forwarded me info from her local paper. Here is the link to that article by Paul Barbano.